We’re not telling you anything you don’t know when we say that today’s job market is intense, across industries and professions, every job opening is met with a rush of talented and qualified applicants from around the country, all vying for the same spot. With hundreds of people applying for open positions, you’d better be sure that every aspect of your job-hunting game is razor sharp, including your resume. If you’re sending out resumes with any of the following things on them, stop what you’re doing and make some changes — fast. Unless you’re responding to a job ad that specifically asks for your salary history and requirements (and if it does, include it in your cover letter), save the salary talk for the negotiation once you’re offered the job. Your first impression and your resume should be all about what you can offer a prospective employer, not what you require from them. Save your limited resume real estate for professional accomplishments and experience, not your social media activities. In fact, it’s much more likely that there are things on your social media pages that could dissuade potential employers from hiring you than convince them that you’re the perfect person for the job. Sure, it makes sense that you want to stand out from the job-hunting crowd and make a lasting impression on prospective employers, but using a magenta-colored font or embedding photos of you and your dog won’t bring you the kind of attention you’re looking for. Hiring managers are busy people with limited time, and won’t sift through a maze of creative flourishes to get to the heart of your resume and figure out whether you have what it takes to handle the job. Help them by making your resume as professional and easy-to-follow as possible. A generic, objective statement is typically a waste of space on your resume, as it likely just repeats the messaging you have in your cover letter, and often is full of tired clichés (more on that later). Besides, hiring personnel know that your primary objective is to get this particular job, or you wouldn’t be applying for it. Are you proud of your Word-Perfect wizardry or your ability to operate a fax machine? That’s great, but keep it to yourself — shining a light on your mastery of outdated office technology will not only fail to impress potential employers, it will make you seem out of date. Also, don’t bother talking about your skills with obvious office tools like Microsoft Word, telephones or email. In today’s job market, your ability to navigate basic office technology is a given, not a bonus. Are you a "team player," your office’s "go-to person," or a "passionate self-starter"? While these may all be true, these tired and worn phrases come off as weak and meaningless on resumes — they’re simply overused, generic clichés that have long since lost their ability to impress hiring personnel and make you stand out from the crowd. Save your bullet points for targeted, measurable, results driven facts that drive home your perceived value as a prospective employee. This one seems obvious, right? Well, you’d be surprised by how many people think that too, and then send out resumes with glaring typos on them. A nationwide survey released by CareerBuilder found that 58 percent of resumes received by those polled had typos. Sloppiness is not a good way to introduce yourself! to prospective employers! 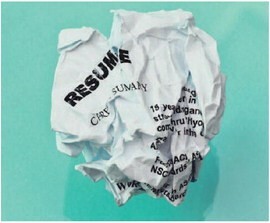 After crafting your resume until it’s just right, be sure to check it carefully for errors — and then check it again. Better still, have someone you trust review it as well. Only when you’re absolutely, positively sure that your resume is free from typos and mistakes should you even think about sending it out. Along with your cover letter, your resume is going to serve as your first impression, so there’s simply no room for error. Make sure that the things mentioned here are as far from your resume as possible, and you’ll be sure to make a better impression on hiring managers and prospective employers. Eric Titner is a career advice journalist for TheJobNetwork.com where this article was originally published. He investigates and writes about current strategies, tips, and trending topics related to all stages of one’s career. You’ve submitted your resume for a job opening, and now you’ve got your first bite — a phone interview. You might encounter the phone interview for two reasons: You’re currently far away from the hiring company, or the company wants to do a preliminary screening. Either way, it’s likely a precursor to some kind of physical meeting. The main goal is usually to see if you meet certain requirements and would likely be a good fit for the job. If a company has a lot of great-on-paper applicants for a single position, phone interviews are a way to narrow the candidate pool. How do phone and sitdown interviews differ? There’s the obvious format difference, for starters. Instead of physically sitting face-to-face and being able to read body language cues, you’re sitting by yourself. That can be a benefit, but also a drawback. You’re in a bit of a void, counting on your conversational skills to get you through to the next round. Also, while an in-person interview is usually with the hiring manager, you may be talking to a human resources representative or a recruiter for a phone interview. It’s important to know who the interviewer is upfront. If it’s a recruiter or HR person, you can be a little more general. If it’s the hiring manager, you should be more detailed about your qualifications. Make sure your voice is calm, confident and conversational. It may help to to dress up in your normal interview clothes and call a friend or family member right before the interview to get into a conversational mode. You want to come across as friendly and competent. Make sure you’re allowing the person to finish speaking before you answer, and don’t feel like you need to fill in any brief silences with nervous chatter. Do your homework on the company, the job and the interviewer. The beauty of the phone interview is that you can have notes right in front of you, without the interviewer knowing you’ve got a crib sheet, or the talking points about your resume that you want to emphasize. Lastly, make sure you’re settled in a quiet spot where you can conduct your interview in peace. Limit your answer to a few highlights about your career, especially those relevant to the job for which you’re interviewing. An elevator pitch comes in very handy here. "What interested you about this job?" This is where your preinterview research comes in handy. Talk about one of your goals that this job would help you achieve or mention something you like about the company. Make it clear that this job is an opportunity you didn’t want to miss. The more specific and authentic your answer, the better. "Tell me about your current/most recent job." The interviewer isn’t necessarily interested in every one of your daily tasks, thoughts and opinions about the work. Instead, focus on the parts of your job that relate most directly to the job you want, and highlight the accomplishments. "Why are you leaving your job?" Part of the phone interview process is weeding out people who aren’t a good fit. They want to know you’re not a flight risk or unable to work as a member of a team. The answer shouldn’t focus too much on what dissatisfies you about your current job. Instead, emphasize your goals and this new job. A phone interview may not be the main interview in your hiring process, but it’s such an important first step that it should be treated every bit as seriously as any other kind of interview. Being prepared will help you be read! y to answer any question that comes your way.